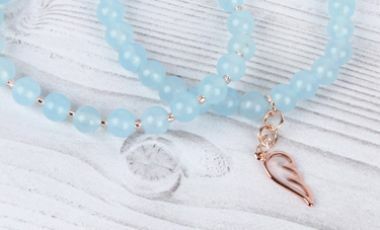 Today’s Mini-Make are these beautiful Sky Blue bracelets, using aqua blue jade beads and a stunning rose gold angel wing charm. Blue is my favourite colour and I couldn’t resist the beautiful tones of these semi-precious aqua blue jade tones. I used rose gold with the blue tones as it works really well together, it also matches with my rose gold watch which is a bonus. You could also try creating this design using silver coloured components. I hope you like this week’s Mini-Make. Cut 1x 30cm of 0.5mm elastic, thread on 26 aqua jade beads to create a 6.5″ bracelet. Link three jump rings together, attach the wing charm and thread onto the elastic. This will create a 6.5″ bracelet. Cut 1x 30cm of 0.5mm elastic cord, thread on one seed bead and one aqua jade and continue until you have placed 23 aqua jade beads and 22 seed beads. This will create a 6.5″ bracelet. Finish this bracelet as above.